Occasionally a producer can quietly develop for some years before they come to the wider attention of the public, each release surrounding the talent with more good will and promoting their name in the process. The name Lord of the Isles has been increasingly spread of late. From modest beginnings, releasing on relatively unknown labels like Adult Contemporary, Catune and Ene, the producer’s name has gone from a whisper to a buzz, catching the attention of the Phonica, Unthank and Shevchenko imprints more recently. His hypnotic brand of disco and boogie-tinged house has found favor among the listening public as well, furthering his reputation and placing his releases in high demand. With little information on the Scottish talent available, Little White Earbuds spoke to the producer otherwise known as Neil McDonald to find out more about what makes him tick, his penchant for disco and what we can expect from him next. Ahead of his set this Saturday at Corsica Studios in London with a dizzying line-up that includes Maurice Fulton, Vakula, Juju & Jordash and Magic Mountain High, he also presented us will our 155th exclusive podcast which is a burning selection of house and techno with a sneak preview of a couple of forthcoming LOTI tracks. Let’s start off with some particulars. With a name like Lord Of The Isles, can we safely assume you’re from Scotland? Lord Of The Isles: Yes! When did the name come to you and how long have you been producing for? 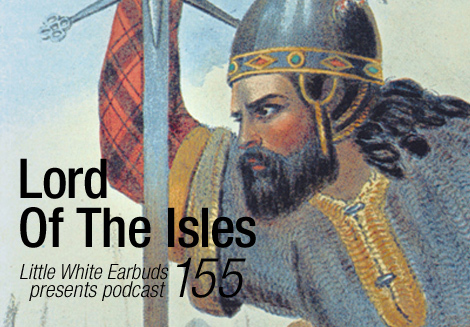 Since I was a boy I have always had an interest in the Lord Of The Isles story amongst Scottish history. I loved the fact they were separate from both Scotland and England — more Gael/Norse and the Kingdom they once ruled (Scotland’s Western Isles) is, in my opinion, one of the most beautiful places on Earth. I try and go there as often as I can, climbing/walking. It’s an inspirational place. I had the idea to use the name a long time ago because of my own name surname. I’ve been writing music since around 95-96. I’d always been involved in collaborations with other people until around nine years ago when I started working on my own stuff. Did you start producing because you were a DJ or did you get in to it the other way around? I remember my younger sister used to have a crappy midi hi-fi system with a dial on it that you could set to sit between Phono and Tape 1 and record both sources simultaneously onto Tape 2. It wasn’t supposed to be able to do that but it did. I used to sit for hours obsessively making mix tapes layering tracks together with no pitch control. Usually tracks with ambient intros or outros or small ambient pieces between full tracks. I then moved onto turntables and quickly after that started buying machines and running Cubase (midi only). How long had you been producing for before you released your first record? I had some records out 1999-2002 as a part of a collaboration. I started working on my own around 2003. Your first releases all came out at about the same time, with tracks on artist samplers for Mad On The Moon, Klik Records and your release on Solardisco. How did these releases come about? Had you been sending out demos to a few labels? Those releases came about through Soundcloud. I never got into Myspace at all, too much guff going on there. When I came across Soundcloud I thought this is good. Nice and streamlined and focusing on the music/ideas/file transfer more. Although it looks like that is changing now unfortunately, seems to becoming overly fussy which is sad. I’m forever switching back to classic mode to use it. It sounds like there’s a pretty strong love of disco going on in your records. Are you more a fan of traditional disco or Italo? I’ve more of a strong love for all things ambient and electronic really. That kind of thing mixed with house, techno and disco. Don’t get me wrong, I love disco, I’m just not an expert on it I don’t think. If I had to choose between traditional disco or Italo… maybe Italo. I love a good tearjerker! You also appear to love a cheeky edit, with Marvin, Tina Turner and Don Henley all getting the LOTI treatment. Can we expect to hear more edits from you? Not sure, maybe. It’s not something I’m planning to do more of. In two recent releases (for Phonica and Unthank) you’ve made shorter vignettes of sounds rather than full tracks. It seems to mark an evolution for you in terms of the quality of sound as well. Had you been working on particular aspects of your production or did this feel like a natural evolution for you? I think people have come to know my style of writing/production a little back to front really. I was making ambient electronica in the beginning. It’s probably the thing that comes most natural to me. It was the inclusion of some of these shorter vignettes on the Ene release from Japan (Pacific Affinity EP) that kind of kicked off an interest in that side of what I do. Those pieces of music feel very personal to me and I honestly didn’t think anyone would be that into them. Chida from Ene had asked if I do other kinds of music so I sent him a load of stuff spanning the whole time I’d been working alone all those years. I was very surprised when he came back with his choices for the release. Probably not the most sophisticated mix you’re likely to hear this year! I quite like it like that; it’s nice to feel like there is a human involved somewhere. It’s all vinyl, no effects, done in one take late at night. It features music from some of my favorite producers right now along with records I’m still playing from 20 years ago. I’ve also included a couple of my new productions that will be released later this year. And what can we expect from Lord Of The Isles over the next year? I’m working on a remix for Jon Hopkins just now. The new Little Strong release should be out next month (Galaxy Near You Pt 01). An album for Ene (Japan), more music for Firecracker, Phonica and Echovolt. I’m really looking forward to the gig this weekend in London for ReviveHer & Phonica. I’m off to New York to play for the first time at the end of April which I’m super excited about (live & DJ) and I will be going to Japan to promote the album which should also be an amazing experience. Can’t wait! Once again, very interesting podcast. Have always loved what the music this guy has made! Nice podcast too! Great podcast by the way. Thanks! I could listen to Pepe Bradock, “Path Of Least Resistance” til the end of time. Great mix. Love his releases too. Quality.